Chock full of quirk and character, this romantic period cottage is bounded to one side by mellow countryside and incredibly convenient for the stunning north coast and beaches. Renovated from tip to toe, Menna Cottage is a gorgeous rural bolt hole for couples and families complete with a warming wood burner for winter breaks and a private and garden enclosed with post and rail fence with idyllic far reaching countryside views. 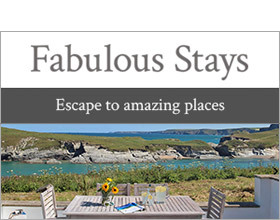 Located in the rustic hamlet of Menna in the heart of Cornwall, the sandy beaches at the vibrant resort of Newquay are within a 20 minute drive. For guests who wish to bring their four legged friends there is Newquay's fantastic Fistral Beach, the big-league venue on the British surfing scene which has a huge tract of golden sand and no seasonal ban on dogs. For families, there is easy access to the Blue Reef Aquarium, Dairyland Farm World and Newquay Zoo and for walkers there is the startlingly beautiful coast path which traces magnificent cliff tops to Watergate Bay and Padstow. For a complete contrast head to the south coast and visitor hot spots at the fishing village of Mevagissey, the world famous Eden Project and Charlestown, renowned for its tall ships and for the filming of the BBC's Poldark series. The A30 is close as too are rural pubs serving Cornish ales and home-cooked produce. You will discover Menna Cottage nestled beside a main road with parking for two cars in front. Step through a stable door into a twin aspect, open plan living room and first impressions are of comfort and simple elegance. Period features including a wood burner set in an inglenook fireplace with a granite lintel, exposed beams, oak floor boards, latch doors and deep-set windows, blend with modern amenities. There is a dining table to seat four and a classic shaker style kitchen with all the mod cons including a Dualit coffee machine. Head upstairs and you will discover a bathroom and two bedrooms. The double bedroom has a strong romantic presence with antique furniture and a Georgian bed topped with a deep mattress and gorgeous bed linens whilst the twin bedroom boasts dreamy countryside views. The garden is accessed via a side gate at the front of the property and there is a barbecue and fire pit for summer R&R. Two bedrooms: 1 x king size double, 1 x Twin. Bathroom with bath, shower over, basin and WC. Ground floor open plan living room with woodburner, kitchen, dining area and sitting area. The cottage is very helpfully located to make it easy to get to the north and south coasts. Note: Regrettably no children under the age of 2 years old. Note: Check in time for this property is 4pm. Note: This property is situated on a busy road.